A recent quick-sketch double caricature of Pope Francis, who’s often seen smiling and giving a thumbs-up. The guy’s got a great smile. Occasionally he will give a double thumbs-up, though it’s usually less flashy than the one I drew. Here he is, responding to my work. Very kind, Your Eminence– thank you! 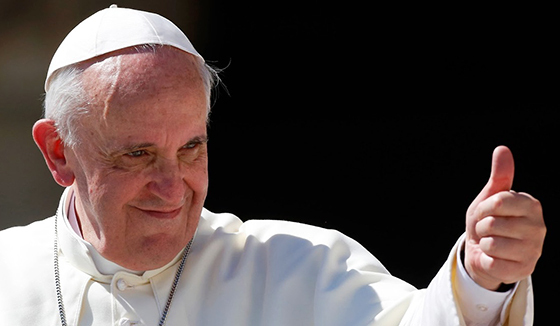 Are you a fan of Pope Francis? Is a person’s smile a pretty good indicator of their sense of humor? Do you think the Pope will be canonizing me any time soon?? ← Posy Puzzler: What’s The Lone Ranger’s Favorite Flower? Yes, he does have a great smile. Smiles are soooo important. Yours is super, too! LOVE the illustration — that thumb-icon is perfection! Saint Markarmstrongillustration? A little long for a saint’s name, but not unheard of. I just looked up the list of names and most are a bit shorter. Well…a lot shorter. The long ones seem to work bec someone’s added descriptors, like “Saint So-and-So the Confessor” or “Saint Immaculate XYZ of the Pristine ABCs.” Maybe “Saint Armstrong of the Illustrative Marks?” It combines all 3 names. Sorry if this was anywhere near sacrilegious. I’m sick of shoveling snow and my annoyance is leaking out in odd ways. Great to see you, Robin– your wonderful comments are one of life’s most intoxicating elixirs!! Haha.. nice.. did he actually give you a thumbs up? Ha!! Actually, he was giving me a thumbs-down, but he was standing on his head at the time, so I just took the liberty of turning his picture upside-down. Or do I mean, downside-up?? Anyway, I had tea with him this afternoon, and he explained that he was so overcome with joy upon seeing my drawing, that he did a headstand, and was really giving me a thumps-UP. I’d be very impressed if the pope was at all aware of your work. Perhaps send him this one? Always appreciate your humor and support, sir– thank’ee!! I suppose he follows your blog. Thats why he is always in good mood with a big smile. There are rumors that they are looking for an illustrator to pep up the bible. Have you already got call? Thank you for your most outrageous and wonderful comment!! Awwww, blessed they are INDEED!!!!!! Does humorous illustration have a moral dimension? Can it be construed as a good? Yes. I think Pope Francis would be delightfully amused and honored of your portrayal. I really like what I’m reading about him, his outlook, his focus, and his outward demeanor. I don’t know very much about Pope Francis, so I can’t say that I am a fan, but I do approve of his approval of my favorite illustrator! Yes, a person’s smile tells a lot about a person. Even more so – their eyes when they’re smiling. Besides making me laugh, your pun associating canonization with canon, the artillery piece, brought back a memory: I once had an assignment which required a cartoon drawing of a guy so unpopular, he was canonized with a canon– complete with a limerick! I’ll see if I can dig it up and post it on my Facebook page. YAY!! Safari let me LIKE this! And I really, really do. Thank you, my dear Mia!! A supportive comment from a person with your myriad artistic talents is worth its weight in… well, in chocolate-covered peanuts! !– and I can’t give higher praise than that!! Oh, my! Now I’ll have to go look for my socks. Your comment knocked ’em clean off ’bout a country mile!! I dislike trudging thru snow in my bare feet, but this time I’ll be doing it with a big smile on my face!! Ha!! No one laughs better than you, Inge! I’m always amazed how your mighty laugh rolls across the ocean, and shakes the house to its foundation!! It always knocks my moose head off the wall, but I don’t mind– it’s worth it!! Carolyn!! How lovely to see you! It’s been ages. Love your new gravatar as well– welcome!! As is my habit*, I praise the Lord who is pleased with your humour. Mark, et benedictum eloquium tuum, opus! Mark, blessed be your work, if Google translate is to be trusted? Hmmm… it’s only now that I knew that there is Pope Francis. Thanks to you Mark for bringing him alive in one of your illustration masterpieces. Yes, always some delightful comment exchanges here at the Armstrong Donut Shoppe. I seem to attract some very interesting visitors– like yourself, for example! !